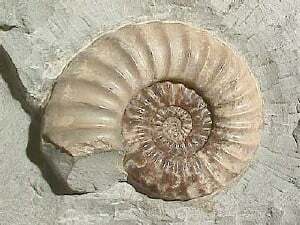 Photograph of the ammonite Asteroceras obtusum taken by Dlloyd. The specimen is from the Jurassic Lower Lias Formation, Obtusum Zone. Locality - Lyme Regis, Dorset, England. Complete calcified specimen, measuring 11.5 cm (4.5") in diameter, in limestone matrix. This page was last modified on 20 January 2007, at 21:16.